Backpacking Philippines: Eat Sea Urchin/Tajom/Tayom/Uni/Ricci di Mare- Filipino Style! Eat Sea Urchin/Tajom/Tayom/Uni/Ricci di Mare- Filipino Style! Locally called tajom in Surigao, Tutubi's friends brought a plastic bag full of the sea urchin for just PhP20.00 at Cantilan market and was served, what else, but kinilaw style. Tutubi has been looking forward to eating them just to taste for quite some time now but his wish was granted, without him asking for it, by his friends who informed him it's a usual part of daily fare, uncommon in urban jungles of Manila though. 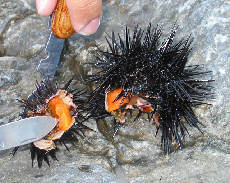 As they always say, the sea urchin is an aphrodisiac though there's really no scientific proof to it. Sea urchins dont' actually taste slimy, has a unique texture to it and are, actually, good. Now where can we find the urchin served in Manila restaurants, anyone? Japanese restaurants have it as uni, but not popular even in Makati in other forms, probably due to supply problems. 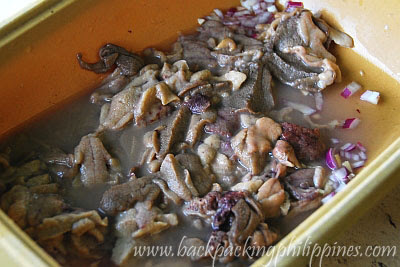 I love kilawin... that looks so tasty. i'm looking forward to tasting these. they're pretty expensive in the restaurants. wow! !you want a delicious food trip?just dine with Cravings Katipunan to try their Filipino Food,pastries and cakes and the warm welcome and service of their staff. If you want also to learn the techniques and principles in Hospitality Industry just inquire and enroll at Asian School of Hospitality Arts.